This trip was made possible by putting a new, longer stem on the Bianchi Milano, giving the front kid ample knee room. It’s a shame that it’s matte black rather than shiny and has a big Specialized “S” on it, but I shouldn’t complain for $5. Thanks Recycled Cycles! They’ve got a bunch of used stems in the bin if you’re due for a change. This is actually my second expansion–did the same thing for kid #1 a couple of years ago–but with an inch of new room, we’re set until we outgrow this setup completely. The first leg of our journey took us to Bike Works in Columbia City for the southside Kidical Mass ride. I never realized before today just how easy it is to get to Bike Works. Not easy in the non-strenuous or speedy way, but the route is very straightforward. From North Seattle, one just follows the well-marked Lake Washington Loop–I’m a sucker for a route with lots of signage, plus the twisty-turning parts through Montlake remind me of navigating Baja La Jolla in San Diego–and then rides up through Genessee Park, bikes one block along Alaska, crosses Rainier at the light, and then cuts through Columbia Park. Kidical Mass rode to the Columbia City Little Free Library (South Lucile Street at 46th Ave South) where we checked out a few books so we’ll get to enjoy the ride down here again soon when we return them. Then we explored future Rainier Valley Greenways which were all wonderfully quiet and marked with old bike dots on our way to King Donut-Teriyaki-Laundromat. Then went multi-modal (which you may have guessed from the fact that we’re on the small bike) and took the light rail and a bus to a birthday party at the Highland Park Improvement Club–a great space with a fun dance party facilitated by Gildenfire Dance. This was our first time stopping at the Tukwila International Boulevard Station where we were wowed by the public art. It started with a steep downhill ride along Highland Park Way SW. I didn’t feel comfortable on the sharrowed four-lane road so I stuck to the asphalt sidewalk. But then we got on the Duwamish Trail which was really nice. Much of it was my kind of scenic–away from the road with a view of the water–and the rest was the boys’ cup of tea–train tracks, containers, and forklifts. Nearing the West Seattle Bridge, the trail crossed the street and became Duwamish Route and picked up a bike speed limit. Certainly not as great as a bike-specific trail, but a nice compromise–and well-marked! The best part of the whole day was when we saw a freight train from the West Seattle Bridge. Passing through South Lake Union, we saw the new bike racks in front of soon-to-be Via6, the new bike-centric apartment building where Velo Bike Shop will relocate. It’d be nice if those orange cones marked off future cycletrack or on-street bike corals, but I think they’re just protecting the construction zone. This city isn’t ready to be that bike-centric just yet, unfortunately. The kids were cold and exhausted by the time we got home from our nine-hour day, but what a Chilly Hilly eve of a day it was! I jumped into the errandonneuring game three and a half days late after seeing Errandeur is a French word for people who do errands on their bikes on the Cascade Bicycle Club blog. It’s a winter biking challenge from Chasing Mailboxes in DC and was oh-so-fun! “Errandonnee: Complete 12 errands in 12 days and ride a total of 30 miles by bike between February 9-20.” The kids were various degrees of ill the first week so that added an extra dimension of challenge to the challenge–imagine how much more we could have done in perfect health! Following is my looong recap of the challenge. Forgive the extra stuff–we often get sidetracked by public art. Here’s my official control card. After the kids went to sleep I rushed out to drop our ballots at the voting van on campus. This was one of my after-dark rides and my lighting was: Knog Beetle on the front, Knog Gekko on the back, Bike Glow for side visibility and Bike Brightz for down-low glow. I picked up a Kyler Martz Adventure Print to give Mr. Family Ride for Valentine’s Day. They’ve been on display since the Bike Love Party and there are still several left, if you’re smitten like me. Observation: Hey, Nord Alley didn’t smell like pee today! Observation: Mildly sick kids are not too sick for donuts. As seen on Seattle Bike Blog, I transported a cardboard box for my friend since it was too big to fit in her car. So fun! Observation: This box was too big to fit in my friend’s car. Today was the first day we’ve seen the sun in five months! Or so it felt. Observation: For being on the Burke-Gilman Trail, I really wish there was bike parking here. Observation: 12 books per kid makes for a reasonable load. Stopped in for a snack and picked up a much-needed Velo Orange Bungee Cord Cargo Net. Observation: Crane is making hand-painted bells–pretty! I’m not sure how to record this errand. I waited patiently (and by that I mean I routinely pestered, whined, and banged around loudly) for Mr. Family Ride to finish work so I could leave the darling sick children in his care and run out to a friend’s going away party at which there would be food (dinner!). But the party ended embarrassingly early and I missed it all. So I hit Met Market on the way back home and dined on cheese samples and “salmon” pate (shouldn’t the “pate” have been in quotes, not the “salmon”? I have no idea what it really was). So it was still a dinner trip, right? I also bought ice cream to bring home so there was a bit of grocery involved. Observation: I need to open that Amazon box containing my new rechargeable lights already–it’s hella dark on the unlit parts of the Burke-Gilman Trail! Not an errand, but thanks to the train mural for being the bait to lure the sick children out of the house. I hoped we’d frolic a little and then move up the block to the U-District farmers market because I heard there would be baby goats on hand…but the frolicking lasted long past market time. Mr. Family Ride isn’t a fan of my sideways transport of pizzas–apparently he doesn’t like all the cheese on one half. Thanks to yesterday’s new cargo net, I can pop them on top of my front basket and keep them flat. Observation: New cargo net FTW. And more public art…we passed Hammered Man at the Blue Moon Tavern on our way home. If Hammered Man is drinking, the tavern is open. Can’t reveal the nature of the meeting, but it’s bikey and awesome and in due time things will be revealed. I left the sick kids home and flew down on my road bike–it’s such a treat to beat the Google maps time estimate by 25 minutes, rather than have to add that much time to it! There are a lot of roadies on the Lake Washington Loop so while I felt one of the crowd in my cycling jersey (won it in a Go Mean’s Go caption contest!) and shoe covers, no one else was cycling in a skirt and messenger bag so I didn’t get any head bobs of recognition. On the way home I saw a family of five spread between a tandem and a triple and got to dreaming of the day we’ll all pedal together. A triple would certainly be nice, but I think a more realistic dream is a tandem with Burley Piccolo trailer bike attached. Observation: I love the signage along Lake Washington Loop. I used the Big Dummy to carry the two kids, my cyclocross bike, and our Burley Piccolo trailer bike and its rack to Recycled Cycles. Handy people attach the rack to their bike themselves, but I’m not handy (especially with two little “helpers”). The shop was very busy due to the holiday so we left the bikes and our number and tried to leave…but got sidetracked by sidewalk chalk. Every bike shop should provide sidewalk chalk! The kids played for so long that by the time we finally got ready to roll to lunch, the phone rang that the bike was ready. Observation: President’s Day is super busy. We traveled a few blocks for lunch at Voula’s before the uphill climb back home. I doubt this was my heaviest load, but it was such a pain to lug back home. My cross bike was leaning out to the side a bit and the Piccolo’s weight is up fairly high so that may have added to the challenge. Observation: Go check out the submerged Space Needle painting by a customer. On the way to dinner I checked out the soon-to-be Peddler Brewing Co. It’s so cool! I hung my bike from a hook on the wall–can’t do that with the mamabikes! There was no food at Peddler’s so we headed to Hale’s Ales, conveniently located on the Burke-Gilman Trail. I put my new headlight on so I rolled nice and bright with Cygolite Metro 300 Lumen headlight, Knog Gekko rear light, Bike Glow side lights, and Bike Brightz down-low glow. My usual ride, the Surly Big Dummy cargo bike has a dynamo hub with always-on headlight and tail light as well as Pedalite blinkie pedals for side visibility so I’m still fine tuning the visibility of my other bikes. Observation: Cygolite Metro 300 Lumen headlight = NICE. I haven’t been gainfully employed in over five years, but I’m counting school dropoffs as my work. Hope that’s cool. Today was an exciting day: we got Engine Engine Engine version 2.0 up and running (I’ll post about it soon) and dropped the pieces off as we went–three-year old and trailer at preschool and then five-year old and Burley Piccolo trailer bike at elementary school. The bike counter didn’t count EEE the first time over, but it did count me + Piccolo on the way back. And then it didn’t count me + trailer after preschool. Observation: The bike counter doesn’t like Engine Engine Engine. Picked up some little airplanes to put in a shadowbox for a toddler preschool project. My five-year old used to call this dancing bacon “Spongebob”–heh. Observation: The best place for two-headed evil baby dolls. Printed out some pictures for the preschool shadowbox. And found an awesome sasquatch-in-a-shot-glass to give to my brother when we visit next month. Paid a quick visit to our local library for some book returning. Observation: Would be more bike-accessible if Woodlawn was two-way here…or was one-way for cars with a cycletrack! I forgot to take a photo at preschool, but here’s my bike at the taco truck afterwards, picking up dinner for Mr. Family Ride. Life is rough without cargo capacity! Two blocks with a nylon bag over the handlebars isn’t exactly hard, but it’s not classy. Observation: Evening bike traffic jam on the Burke-Gilman Trail. Same as yesterday. I meant to borrow one of Mr. Family Ride’s panniers, but forgot so after leaving the trailer locked up outside preschool, I had to partially shove my messenger bag in the five-year old’s backpack and wear that for the second leg of our school commute. Still working out the EEE kinks. I wondered yesterday if the bike counter ignored my long confusing bike because I had to wait for a pedestrian to clear the Fremont Bridge and rode over the sensor very slowly. Today I cruised over at normal speed and got counted twice. So I guess we’re square. Observation: The bike counter did count a faster Engine Engine Engine (twice). Grabbed a pannier (shh) before fetching the preschooler so I could pick up a few groceries on the way. I think I need my own pannier so I can get used to its carrying capacity–I order did things a bit. Observation: I saw the two most hipsterest hipster bikes here today. Today’s Family Ride post on Seattle Bike Blog was Gotta haul something that won’t fit in your car? Call your friend with a family bike! in which I toted a big empty box for my friend. It’s been up 9 hours and while I didn’t expect it to generate oodles comments like My least favorite intersection, I’m a tad disappointed no one pointed out my dragging strap. I’ve learned not to tell Mr. Family Ride about my endeavors ahead of time (though I know his “That looks sketchy” is always said with the utmost affection), but when I showed him the picture last night, he immediately zeroed in on said strap. Apparently I could have caught it on a large stick or a manhole cover and gone down in flames. I was just happy to have remembered to bring scissors down to the garage to finally free my not-so-new-anymore ratcheting tie downs from their container. But I didn’t think I needed to waste time reading the instructions (since I didn’t actually remember the scissors and had to run back in the house while the kids fought over the standing bike pump). So the box is held in place with two tie downs, not ratcheted in place, but rather knotted to various parts of the bike. And one trusty bungee cord for good measure. All made possible by the Xtracycle WideLoader under the box. Props to Matt of Tacoma Bike Ranch who both introduced me to the idea of tie downs and sold me his extra WideLoader for super cheap. And now I know how to ratchet my tie downs…so lemme know if there’s anything you need help hauling! Ah, the infant bucket seat. For many, an integral part of having a baby. I didn’t have my babies in hospitals, but I’ve heard one isn’t allowed to leave with the new baby until having shown the nurse an adequate car seat and demonstrating infant-insertion skills. Infant bucket seats are useful for many biking families, too. I haven’t been able to locate the article I read while pregnant with my second, but it was written by a bike racer who recounted riding with her baby in an infant car seat (these are the kind with the handle and that snap into a base that stays in the car) in a bike trailer. There wasn’t a lot in pixels about riding with babies four years ago, presumably because most states require all children (if not everyone) to wear a helmet while on a bicycle and helmets and car seats don’t fit together so well. Last summer I saw a bike trailer baby in a helmet and a car seat, but most families seem to opt for the car seat only. Totcycle’s Baby on a Bicycle post (birthed before my baby, but after I’d found the other article) contains a lot of useful information if you’re looking to bike with a baby. I got our infant car seat free from a neighborhood mom (she received two as gifts) and it came with three bases–one for mom, one for dad, one for nanny. Wowzer. So for two years those four bulky plastic hunks have been taking up a whole bike’s worth of space in our garage. We Seattleites are fortunate to have car seat recycling–see CoolMom’s Car Seat Recycling page for information and links to resources in other cities. Babies R Us routinely has car seat trade-in events, offering savings when you bring in old equipment (here’s the FAQ from one that just happened), but from my poking around online, it appears some locations recycle the car seats and some just throw them away. I don’t feel quite as accomplished when I haul big things if I only have one (or gasp, none!) 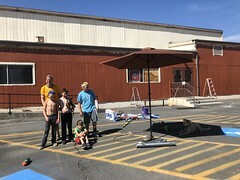 kid along for the ride, but the little guy and I loaded up his old car seat with a couple bungee cords and made the 4.5-mile uphill trek to Childish Things where they took all four pieces for a $5 donation and will transport it to Westside Baby for recycling. Not at all related to car seat recycling, but do you ever find treasures in the bike lane? Bike Lane Puppy is a doberman Beanie Baby we found on Roosevelt Way a year ago–he’s the sock-clad puppy on the right in my front basket. Today’s score was a pink golf ball on Green Lake Drive. I’m the new Seattle Bike Blog Staff Family Cycling Expert! I’ve just written a post whining about my least favorite intersection. It’s certainly not the worst intersection in town, but it rains on my parade three mornings a week. Read the whole post on Seattle Bike Blog. Having just attended What can we learn from Dutch street design? (yes, that’s the back of my head in the photo :) ) presented by Seattle Neighborhood Greenways, I’m sad at the state of our streets and jealous of bicyclists in the Netherlands. I believe SNG filmed the presentation so hopefully those not lucky enough to attend can see Fred Young’s presentation soon. Last night the kids and I checked out Bicycle Alliance of Washington’s Bike Love Party. The party was great, but I’ve come to realize I no longer like biking on 3rd Avenue (or Dances with buses) downtown. I don’t think I like any street downtown.